Fires are one of the most common hazards occurring in the forests, and are considered as a serious threat to the forest resources, environment, and wildlife. Forest fires can occur as a result of natural as well as human-induced/anthropogenic factors. Fire initiation and spread depend on several important factors such as the amount and frequency of precipitation, the presence of ignition agents and conditions like topography, temperature, lightning, fuel availability and distribution, relative humidity, and wind velocity. Forest fires can cause loss of biodiversity, forest degradation, soil erosion, and atmospheric pollution. Fire emissions have significant impact on atmospheric and biogeochemical cycles and the Earth’s radiation budget. Forest fire is a recurring phenomenon in the forests of India. A significant number of forest fires occurring in India are due to the anthropogenic activities. The Achankovil forest division, a part of the Western Ghats, is also prone to fire, with a total of 15 forest fires having been reported for the past 11 years. In this region, any disturbance will negatively affect the rich existing biodiversity. The period of major risk for this area is from February to April, when the high temperature and low humidity along with high wind velocity, and the abundance of dry fuel increase the chances for the occurrence of forest fire. Most of the previous studies on forest fire risk assessment were based on remote sensing (RS) and geographic information system (GIS) techniques.,,,,,,,,,,,,,,,,, Few studies had used remotely sensed spectral indices for the assessment of fire risk.,, Ariapour and Shariff prepared rangeland fire risk zone map of Boroujerd rangelands in Iran using RS and GIS techniques. The selected factors were fuel type, elevation, slope, aspect, road accessibility, settlement, temperature, precipitation, evaporation, and river. Sivrikaya et al. prepared forest fire risk zone map of Yeşilova Forestry Enterprise in Turkey using GIS techniques. Variables such as species composition, stand crown closure, development stage, slope, insolation, distance from settlement and agricultural land, and distance from road were used for the study. Ajin et al. demarcated forest fire risk zones of Nemmara forest division in India using geospatial techniques. Factors such as fuel type, slope, elevation, road density, and settlement density have been selected. 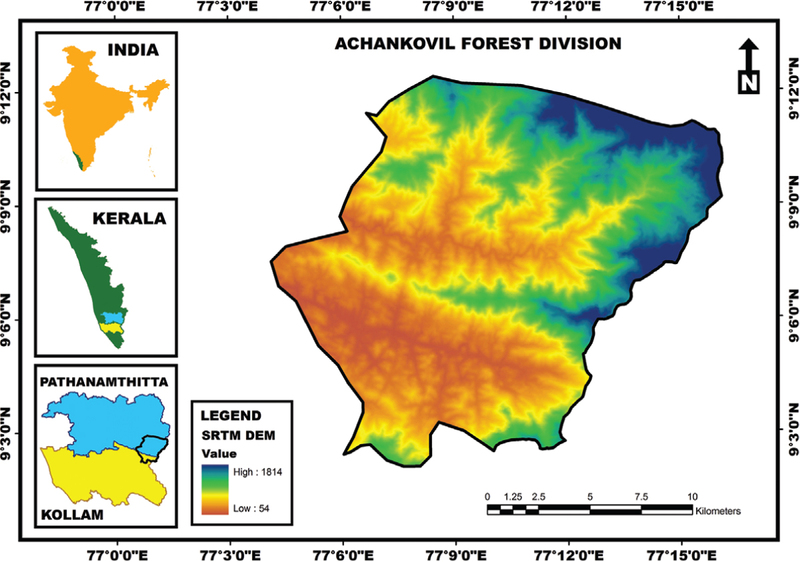 This study intends to make an attempt to demarcate the forest fire risk zones of the Achankovil forest division applying RS and GIS techniques. Five significant factors, viz., land cover type, slope, distance from settlement, distance from road, and elevation were chosen to generate the fire risk zone map. The risk zones of forest fires were delineated based on the Fire Risk Index (FRI) method. The present study area, Achankovil forest division, is located within 9°2′0″ and 9°13′0″ N latitudes and 77°4′0″ and 77°17′0″ E longitudes. With a total area of 256.30 km2, this forest division is bordered by the state of Tamil Nadu to the east, Ranni forest division to the north, Konni forest division to the west, Punalur forest division to the southwest, and Thenmala forest division to the south. The study area map is shown in [Figure 1]. The study area is represented within two adjacent Survey of India (SOI) topographic maps numbered 58 G/4 and 58 G/8 in 1:50,000 scale. For this study, different thematic maps were required. Such thematic maps were prepared using software namely ERDAS Imagine 9.2 and ArcGIS 9.3. Map representing land cover types was prepared from the IRS-P6 LISS-III image of 23.5 m resolution. The supervised classification of the preprocessed satellite image was conducted using ERDAS Imagine software. 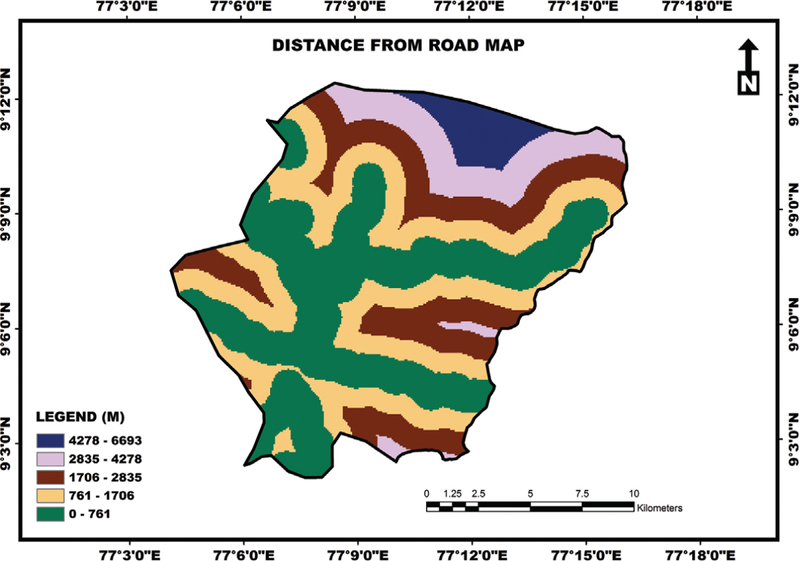 From the SOI topographic maps and Google Earth, the road networks and human settlements were digitized. 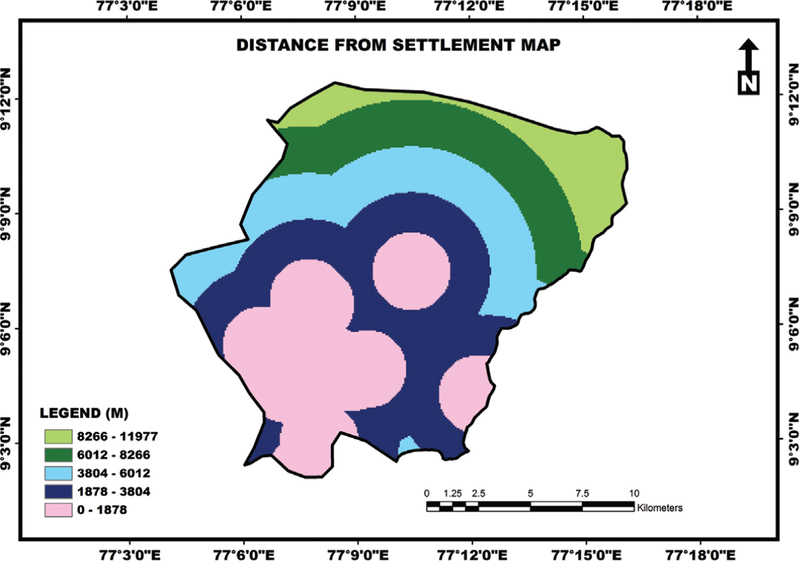 Using the ArcGIS spatial analyst tools, distance from road and distance from settlement maps were prepared from the already digitized data. From SRTM DEM of 30 m resolution, necessary contour data were derived. From the 20 m interval contour data, slope and elevation maps were prepared using ArcGIS spatial analyst and 3D analyst tools. Forest fire risk zone map of the area was prepared using the FRI method., These thematic map layers were reclassified using Natural Breaks (Jenks) method. Index was assigned to each class of the thematic map layers based on their fire-inducing capability or their sensitivity to fire. The index was derived as a product of the weight and rank (Index = Weight × Rank). The index, weight, and rank details are shown in [Table 1]. By overlaying index map layers using ArcGIS tools, the forest fire risk zone map was generated. The final risk zone map was validated with the fire incidence data collected from the records of the Forest Survey of India (FSI). Land cover type was one of the most important factors, which had the greatest influence on forest fire occurrence. Land cover with dense and dry vegetation was more prone to forest fire than sparsely vegetated and moist areas. The land cover types existing in this forest division were deciduous forest, evergreen forest, agricultural land, wasteland, built-up area, and water body. In this study area, the deciduous forests, the area wherein dry vegetation was predominant, were more susceptible to fire. The deciduous forests were found mainly in the central and southwest parts of this area. 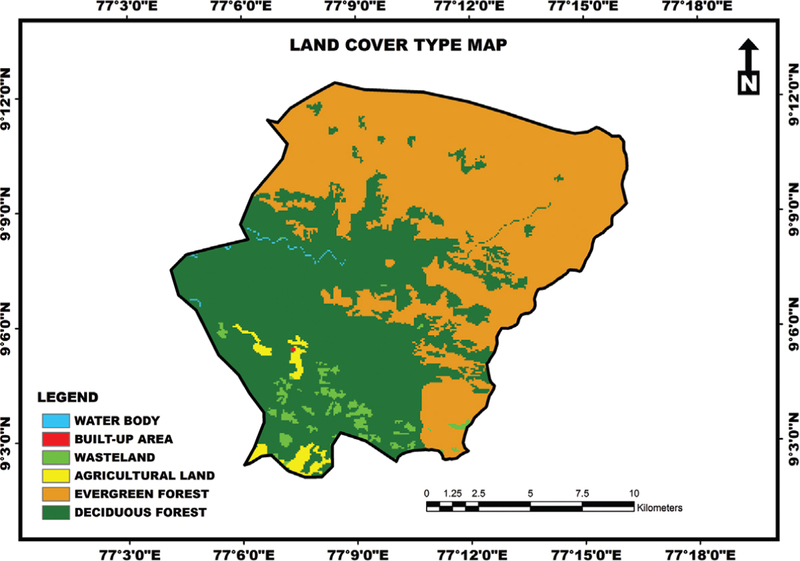 The map representing the land cover types is shown in [Figure 2]. Slope, the measure of steepness or the degree of inclination of the land surface, was another important factor that had significant influence on fire spread. This natural factor affected the rate of fire spread and the fire intensity. The rate of advance and spread of fire were more quick in the upslope direction than in the downslope direction. Further, the rate of spread of fire increased along steeper slopes, as the fire flames moved closer to the ground surface aided by orogenic winds. Major portions of the study area were dominated by steep slopes, which were more susceptible to forest fire. The slope (in degree) of this area was grouped into five classes, viz., 0–9.63, 9.63–16.42, 16.42–22.56, 22.56–29.13, and 29.13–55.85. 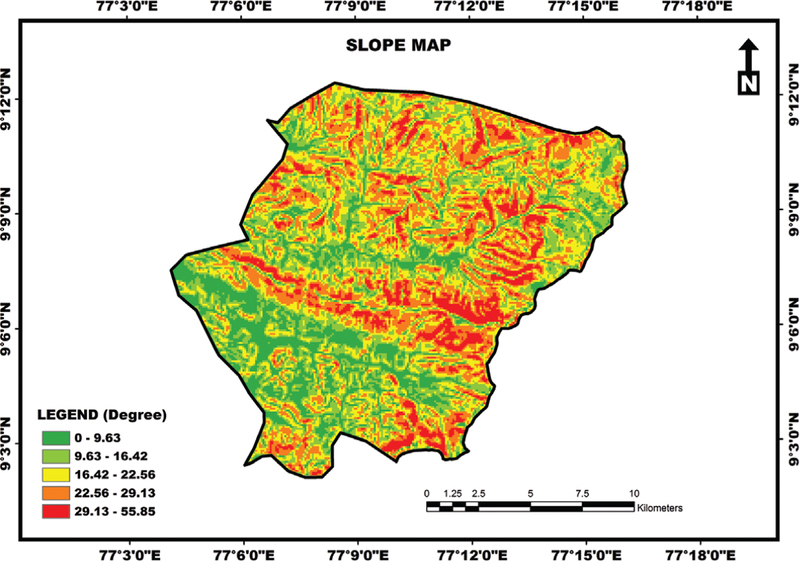 The slope map is represented in [Figure 3]. Another important factor that could become a threat to the forest was represented by the human settlements located near the forests. The tribal villages located inside the forests could also be a causative factor of forest fires. There are two different ways in which tribal populations or tourists can cause forest fires: intentionally and unintentionally. Sometimes, they set fire intentionally for clearing forest path, hiding illicit felling, encroaching upon forest land, and as a part of tribal customs/traditions. Such fires rarely went out of control and escalated as large fires. Unintentional forest fires were caused during the collection of nontimber forest products, from carelessly thrown unextinguished cigarette butts, campfires, and from fires used for cooking. Fires caused unintentionally often flared up to alarming dimensions. Therefore, the areas closer to the human settlements were more prone to forest fires. On the basis of the distance from settlements, the study area was grouped into five classes, viz., 0–1878 m, 1878–3804 m, 3804–6012 m, 6012–8266 m, and 8266–11,977 m. [Figure 4] shows the map representing the distribution of these different classes. The present study area is a hotspot of tourist attraction in the state, because of its rich biodiversity, with fascinating geomorphology made spectacular by the mist covered hill tops and silver lines of waterfalls, attracting a large number of tourists every year. To promote trekking and adventure tourism, motorable roads have been constructed. Any physical activity produced by the tourists on these roads, like throwing unextinguished cigarette butts onto the dry litter, heating bitumen/asphalt for road surfacing, etc., can cause unexpected forest fires. Thus, proximity to the roads plays a very important role in the incidence of fire. 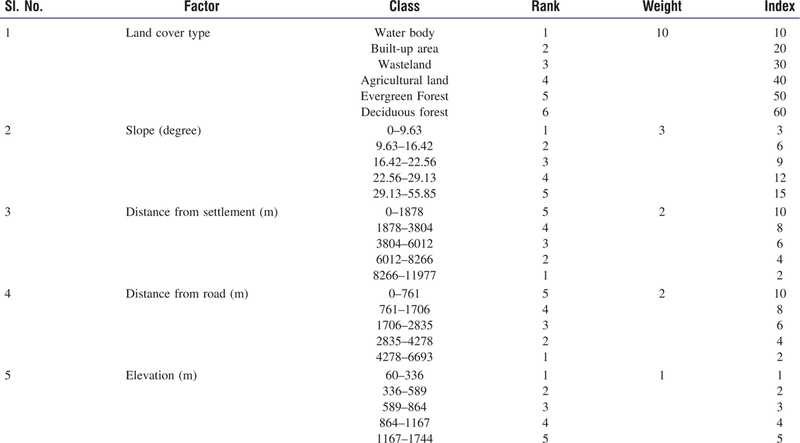 Depending on the distance from roads, the entire area was grouped into five different classes, viz., 0–761 m, 761–1706 m, 1706–2835 m, 2835–4278 m, and 4278–6693 m. [Figure 5] shows the map representing the distribution of these different classes. Elevation represents another very important topographical factor, which had a significant role in fire spreading in a short span of time, because of its association with the wind behavior. Upslope moving convective winds affected areas of higher elevation. High temperature during the daytime caused the rise of warm air resulting in uphill desiccation. Also, at higher elevations, the number of lightning strikes and related ignitions was higher than in the lower areas. In this forest division, the higher elevation areas, which are more prone to forest fires, were found in the north, east, and northeast parts. Depending on the elevation, the study area was grouped into five classes, viz., 60–336 m, 336–589 m, 589–864 m, 864–1167 m, and 1167–1744 m. The elevation map is represented in [Figure 6]. 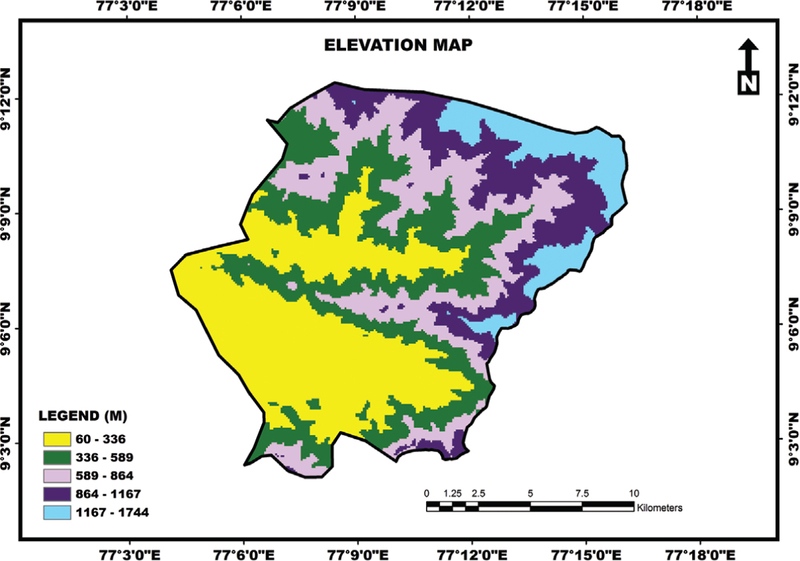 In this mapping process, factors such as land cover type, slope, distance from settlement, distance from road, and elevation were taken into account. During the process, different indices were assigned to each class of these factors, according to their sensitivity to fire or their fire-inducing capability. Thus, the generation of the final forest fire risk zone map was based on the computation of five index map layers. The area of this study was divided into five fire risk zones such as very low, low, moderate, high, and very high based on vulnerability to forest fire. The degree of fire risk, the percentage, and area of each zone are shown in [Table 2]. In this forest division, 55.75% of the area falls under “high” and “very high” fire risk zones, 27.26% of the area falls under “moderate” fire risk zone, and 16.99% of the area falls under “low” and “very low” fire risk zones. During the period of time (2004–2014) considered for this study, a total of 15 forest fires occurred. The next important step is the validation of the prepared risk zone map; for that, the fire incidence points collected from the records of the FSI were overlaid on the risk zone map. This showed that all the 15 incidences were recorded in the high- and very high-risk zones, which showed the reliability of the methodology. From the study, it is clear that 73.33% (11 out of 15) of the forest fires occurred close to the roads. This points out to the fact that the forest fires were induced by humans, intentionally or unintentionally. This agrees well with the present observation that most of the fire incidence points fall spatially over the lower elevations and slopes. The forest fire risk zone map is shown in [Figure 7]. The incidence of forest fire depends on many factors, which play a significant role in the ignition and spread of forest fires. Therefore, the contribution of each parameter in analyzing the forest fires is not equal with the other ones because some parameters have higher influence on forest fires and they play more significant roles. For example, the land cover type with all its classes has a significant role in forest fire occurrence, compared to elevation, which has a lesser influence. A map representing the fire risk zones has been prepared using a method integrating RS and GIS techniques. The area of the risk zone map is categorized into five zones, viz., very low, low, moderate, high, and very high. It is noted that 55.75% area of this forest division falls under “high” and “very high” fire risk zones. The final map is validated, which proves the reliability of this methodology. This study confirms that most of the forest fires (73.33%) were recorded close to the roads. This suggests that the anthropogenic factors are the main reasons for the majority of the fires. The study shows that the methodology presented in this study, based on a combination of RS and GIS techniques, is a reliable approach and tool for the prevention and mitigation of forest fires. This may reduce the frequency of forest fires in the future. The results of this study are useful for all the institutions dealing with disaster management and emergency services and will help the authorities of the forest protection and conservation department to identify more easily the fire risk zones for a better forest fire prevention and management. Dale VH, Joyce LA, Mcnulty S, Neilson RP, Ayres MP, Flannigan MD et al. Climate change and forest disturbances. BioScience 2001;51:723-34. Miettinen J, Stibig H, Achard F. Remote sensing of forest degradation in Southeast Asia − Aiming for a regional view through 5-30 m satellite data. Glob Ecol Conserv 2014;2:24-36. Ice GG, Neary DG, Adams PW. Effects of wildfire on soils and watershed processes. J For 2004;102:16-20. Lazaridis M, Latos M, Aleksandropoulou V, Hov Ø, Papayannis A, Tørseth K. Contribution of forest fire emissions to atmospheric pollution in Greece. Air Qual Atmos Health 2008;1:143-58. Crutzen PJ, Andreae MO. Biomass burning in the tropics: Impact on atmospheric chemistry and biogeochemical cycles. Science 1990;250:1669-78. Jaiswal RK, Mukherjee S, Raju KD, Saxena R. Forest fire risk zone mapping from satellite imagery and GIS. Int J Appl Earth Obs Geoinf 2002;4:1-10. Sowmya SV, Somashekar RK. Application of remote sensing and geographical information system in mapping forest fire risk zone at Bhadra wildlife sanctuary, India. J Environ Biol 2010;31:969-74. Assaker A, Darwish T, Faour G, Noun M. Use of remote sensing and GIS to assess the anthropogenic impact on forest fires in Nahr Ibrahim watershed, Lebanon. Leban Sci J 2012;13:15-28. Chavan ME, Das KK, Suryawanshi RS. Forest fire risk zonation using remote sensing and GIS in Huynial watershed, Tehri Garhwal district, UA. Int J Basic Appl Res 2012;2:6-12. Ghobadi GJ, Gholizadeh B, Dashliburun OM. Forest fire risk zone mapping from geographic information system in Northern Forests of Iran (Case study, Golestan province). Int J Agric Crop Sci 2012;4:818-24. Mahdavi A, Shamsi SRF, Nazari R. Forests and rangelands wildfire risk zoning using GIS and AHP techniques. Casp J Environ Sci 2012;10:43-52. Eskandari S, Ghadikolaei JO, Jalilvand H, Saradjian MR. Detection of fire high-risk areas in northern forests of Iran using Dong model. World Appl Sci J 2013;27:770-3. Rajabi M, Alesheikh A, Chehreghan A, Gazmeh H. An innovative method for forest fire risk zoning map using fuzzy inference system and GIS. Int J Sci Technol Res 2013;2:57-64. Singh RP, Ajay K. Fire risk assessment in Chitrakoot area, Satna, MP, India. Res J Agric For Sci 2013;1:1-4. Ajin RS, Jacob MK, Menon ARR, Vinod PG. Forest fire risk analysis using geo-information technology: A study of Peppara Wildlife Sanctuary, Thiruvananthapuram, Kerala, India. Proceedings of the 2nd Disaster Risk and Vulnerability Conference, Thiruvananthapuram, India; 2014. p. 160-5. Banu TP, Banu C, Banu CA. GIS-based assessment of fire risk in National Park Domogled-Cerna Valley. J Hortic For Biotechnol 2014;18:52-6. Singh D. Historical fire frequency based forest fire risk zonation relating role of topographical and forest biophysical factors with geospatial technology in Raipur and Chilla range. SSARSC Int J Geo Sci Geo Inform 2014;1:1-9. Thakur AK, Singh D. Forest fire risk zonation using geospatial techniques and analytic hierarchy process in Dehradun district, Uttarakhand, India. Univers J Environ Res Technol 2014;4:82-9. Veeraanarayanaa B, Ravikumar SK. Assessing fire risk in forest ranges of Guntur district, Andhra Pradesh: Using integrated remote sensing and GIS. Int J Sci Res 2014;3:1328-32. Ajin RS, Loghin AM, Jacob MK, Vinod PG, Krishnamurthy RR. The risk assessment of potential forest fire in Idukki Wildlife Sanctuary using RS and GIS techniques. Int J Adv Earth Sci Eng 2016;5:308-18. Ajin RS, Loghin AM, Karki A, Vinod PG, Jacob MK. Delineation of forest fire risk zones in Thenmala forest division, Kollam, Kerala, India: A study using geospatial tools. J Wetl Biodivers 2016;6:139-48. Ajin RS, Loghin AM, Vinod PG, Jacob MK. RS and GIS based forest fire risk zone mapping in Periyar Tiger Reserve, Kerala, India. J Wetl Biodivers 2016;6:175-84. Vinod PG, Ajin RS, Jacob MK. RS and GIS based spatial mapping of forest fires in Wayanad Wildlife Sanctuary, Wayanad, North Kerala, India. Int J Earth Sci Eng 2016;9:498-502. Illera P, Fernandez A, Calle A, Casanova JL. Temporal evolution of the NDVI as an indicator of forest fire danger. Int J Remote Sens 1996;17:1093-105. Ceccato P, Gobron N, Fiasse S, Pinty B, Tarantola S. Designing a spectral index to estimate vegetation water content from remote sensing data: Part 1. Theoretical approach. Remote Sens Environ 2002;82:188-97. Sannier CA, Taylor JC, Du PW. Real-time monitoring of vegetation biomass with NOAA-AVHRR in Etosha National Park, Namibia, for fire risk assessment. Int J Remote Sens 2002;23:71-89. Ariapour A, Shariff AR. Rangeland fire risk zonation using remote sensing and geographical information system technologies in Boroujerd Rangelands, Lorestan Province, Iran. ECOPERSIA 2014;2:805-18. Sivrikaya F, Sağlam B, Akay AE, Bozali N. Evaluation of forest fire risk with GIS. Pol J Environ Stud 2014;23:187-94. Ajin RS, Ciobotaru AM, Vinod PG, Jacob MK. Forest and wildland fire risk assessment using geospatial techniques: A case study of Nemmara forest division, Kerala, India. J Wetl Biodivers 2015;5:29-37. Ajin RS, Vinod PG, Menon ARR. Forest fire risk analysis using GIS and RS techniques: An approach in Idukki Wildlife Sanctuary, Kerala, India. Proceedings of the 24th Swadeshi Science Congress, Tirur, India; 2014. p. 406-13. Rothermel P, Richard C. A mathematical model for predicting fire spread in wild land fires. USDA Forest Service Research Paper INT − 115, Ogden, Utah, USA; 1972. Zhong M, Fan W, Liu T. Statistical analysis on current status of China forest fire safety. Fire Saf J 2003;38:257-69.